Hey everyone! 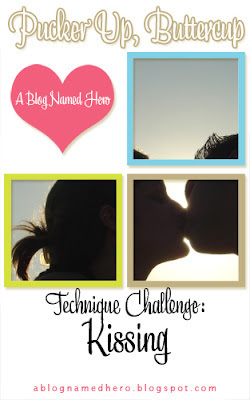 There is a new challenge up on A Blog Named Hero and it's all about KISSING! I started the leaf and floral background. I inked it up really well with Hero's Soft Green Shadow ink. I then inked the friendship definition stamp with Hero's Splash Chalk ink and kissed them together (press the two inked stamps together). When I pulled them apart you could see the definition stamp on the floral and leaf background. It was mottled but I loved the look. I then stamped my card with it. For the flower I used a 3D flower from the Silhouette store, a duplicated it a few times and made about 10 different layers and made them all a little bigger than the next. I cut them out of white and inked them with the Splash chalk ink and some distress broken china. When it was dry I inked up my definition stamp in the Colorbox white frost and stamped each flower with them. When the flowers were all dry I layered them, added a fancy brad and attached it to the card. Lastly I stamped my sentiment. Head over to A Blog Named Hero for the Challenge details. 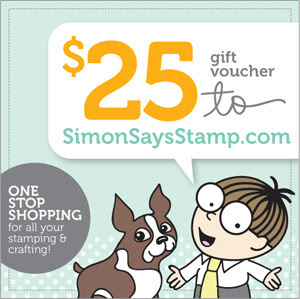 Remember, if you play you have a chance to win a $25 G.C from the FABULOUS Simon Says Stamp! Awesome card! . Gorgeous flower! Gorgeous kissing! The colors are wonderful. This is absolutely gorgeous! Love that kissed background and that flower is stunning! This is gorgeous, Michelle! That flower is amazing!! !